USNS Carl Brashear (T-AKE-7) is a Lewis and Clark-class dry cargo ship of the United States Navy, named in honor of Master Chief Boatswain’s Mate Carl Brashear (1931–2006), the first African-American to become a US Navy Master Diver, despite having lost a leg in the 1966 Palomares incident. The contract to build Carl Brashear was awarded to General Dynamics's subsidiary National Steel and Shipbuilding Company (NASSCO) of San Diego, California, on January 11, 2005. Her keel was laid down on November 2, 2007. The completed ship was delivered to the Navy on March 4, 2009. During Operation Tomodachi, Carl Brashear loaded more than 800 pallets of humanitarian cargo at Sasebo's Juliet pier on March 20 and set sail later that day to join the Navy ships operating off northern Japan. Brashear completed 17 underway replenishment missions, delivering more than 1 million gallons (3,800 m³) of fuel to ships supporting Tomodachi. This article includes information collected from the Naval Vessel Register, which, as a U.S. government publication, is in the public domain. 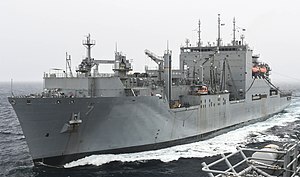 ^ "USNS Carl Brashear (T-AKE 7)". United States Army Institute of Heraldry. Retrieved 2010-03-07. ^ "Navy Gets Cargo Ship Brashear From NASSCO". San Diego Union-Tribune. 5 March 2009. ^ Baxter, Edward (May 2011). "Disaster! Operation Tomodachi". Military Sealift Command (MSC). Retrieved 2011-10-08. Wikimedia Commons has media related to USNS Carl Brashear (T-AKE-7). "USNS Carl Brashear (T-AKE 7)". Naval Vessel Register. United States Navy. 11 April 2008. Retrieved 2008-05-13. Priolo, Gary P. (25 April 2008). 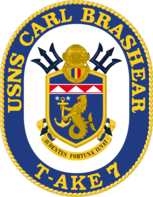 "T-AKE-7 Carl Brashear". Service Ship Photo Archive. NavSource Online. Retrieved 2008-05-13. This page was last edited on 31 January 2019, at 18:31 (UTC).